Honey bee dances keep bee factories humming. Thomas Seeley, Professor of Biology at Cornell University, has a great way of describing how bees go about doing the work of collecting and processing pollen and nectar. He says it’s like a factory, where materials are secured from the outside, and once inside the factory, get processed by workers experienced in the various phases of the production process. In the case of honey bee factories, incoming forager bees bring in raw goods in the form of nectar and pollen. Once inside the hive, the foragers transfer their materials to hive bees who process and transform the raw goods into nutritional food products that bees and humans can eat. In the picture at the top of this page, three honey bees are shown working together in the process of transferring and processing nectar. The bee on the top right is the incoming forager bee. She’s transferring the nectar she just brought into the hive to a house bee. The house bee will mix the nectar with enzymes and bacteria in order to keep it from fermenting. Later she will deposit the nectar into a cell, as the third bee above is doing, where further curing takes place. 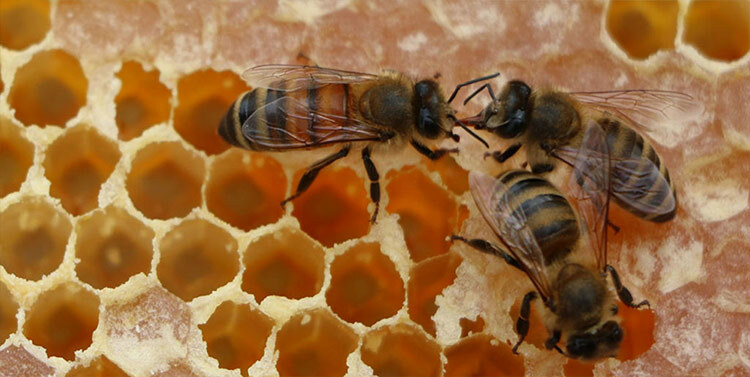 Honey bee dances play a key role in the process of keeping the factory humming. Essentially, honey bee dances tell other bees vital information such as where the best pollen and nectar can be found, and when to start and stop bringing raw goods into the hive. At least three different types of honey bee dances are now fairly well documented. These are commonly known honey bee dances are the shake, waggle and tremble. Honey bees do the shake dance when it’s time to get sleepy foragers out of the hive to collect honey or pollen. The shake dance often occurs when a large supply of pollen or nectar is found, or when more bees have been born that can be available to process the goods when they come into the hive. (It does the hive no good for foragers to be out collecting pollen or nectar if there are not enough house bees to process the goods when they arrive). The video here, found on YouTube, shows an incoming forager bee with pollen on her hind legs, literally going from one bee to the next, shaking them into action. Forager bees tell other forager bees where the good pollen and nectar can be found by doing a dance known as the waggle dance (also known as the wagtail dance). In this dance, the honey bee dancer tells other foragers both the distance to the honey or pollen as well as the direction of flight to the source. She does this through a combination of the number of waggles, the angle of the dance and direction the bee she turns while performing the dance. 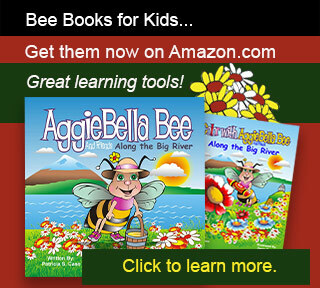 Here are two great videos showing foraging honey bees doing the waggle dance. Both videos are found on YouTube. This 2 minute, 29 second video provides an amazing view of the inside of a honey bee hive, as well as a general overview of the honey bee waggle dance. It’s bound to delight anyone who may be reading this article. Here’s another video describing the Waggle Dance. This one is a bit longer (7 minutes, 28 seconds), and a lot more technical than the previous video. In the honey bee tremble dance, a bee runs about the hive telling other bees, by virtue of her trembles, to get ready to start-up the process of storing food. She dances this dance to alert the otherwise nonchalant bees, about the fact that foragers are now arriving in force with supplies that need to be stored. Here’s a video found on YouTube that gives a good idea of what the honey bee tremble dance looks like. Vista Barn Copyright © 2019.